It’s almost that time again! You know the one that most people dread. Taxes. I can almost see you shaking your fist and rolling your eyes. While it might not be the most fun thing to focus on, it is an important one. Plus, it’s a guaranteed part of life. You know that saying, there are only two things certain in life: death and taxes. If you can’t make them go away, then you might as well embrace them, right? Here are my 5 tips for making tax time, should I say, less taxing? Kidding aside. 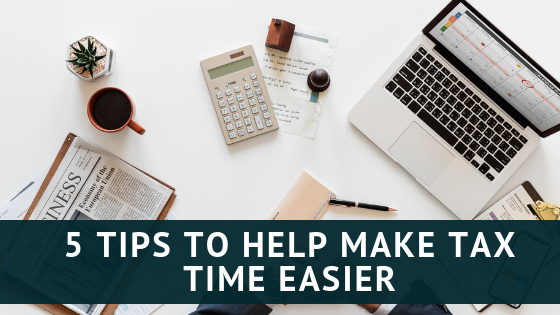 As you start the new year, here are 5 tips to help make tax time easier. Start this as soon as the beginning of the year. Put documents like W-2s and 1099s that arrive via snail mail into a physical folder. You can also choose to scan these documents and save them electronically. Create a folder on your computer or on the cloud for all your tax documents for that year. Make sure you store them securely and are easily accessible for when you need them. There are lots of ways to stay organized with receipts. You can take photos with your phone and add them directly into QuickBooks as an expense. There are also programs like Expensify available for smartphones. You can even use software like Evernote to keep organized and store everything electronically. You get the idea here, right? Use tools to help keep you organized and keep things simple. Whichever method you pick, the most important thing is to stay organized and to keep paper and/or electronic records of all your tax documents. Next up it’s time to keep an eye out for that mail! It doesn’t matter if these documents come via snail mail or electronically. Be on high alert starting January 15 and stay alert for a month or more. Make sure your spam filter doesn’t catch important emails about tax documents. To avoid a problem later with the IRS, I suggest checking snail mail thoroughly. Don’t assume something that looks like junk is junk and toss it before opening it and double checking. It’s also important to check your spam folders for tax documents. If you think you missed a tax document, I also suggest logging into your bans, financial accounts or even a payroll account through an employer. Many times tax documents are available via online logins and employee portals. If you still think you’re missing something, check with the financial institution or your employer. Things can get lost in the mail or possibly even overlooked, so it’s important to be on top of it. First, it’s always important to have records of your tax returns. It doesn’t matter if that’s electronic or paper. Keep good records. If you are able to compare this year’s documents to last year’s return, it can help you miss out on a deduction or an account you may have overlooked. If you are a business owner, you should have either an excel spreadsheet or be using accounting software for all your business income and expenses. This helps you keep track of deductions easily. You might also try creating a tax spreadsheet. This can include any sources of income, total business expenses, medical expenses, taxes paid, IRA contributions, student loan interest, in addition to any tax deductions or credits you took last year. This way you stay organized and don’t miss out on a valuable deduction or credit. It’s important to know that 2018 is the start of some big changes to tax returns, so be prepared for taxes to look and feel different. There are changes to credits, deductions, income limits, etc. It’s still important to have it all organized though, which will make it easier to know which credits and deductions you might qualify for. With all the changes to tax returns for 2018, it’s important to be organized. It’s good to be prepared and organized with all your documents before handing your paperwork to your tax professional. With the tax template or spreadsheet mentioned above, you’ll be able to check off all the items of income, expenses, and deductions. As you receive the paperwork for any of the items on your tax template, you can enter the data and check it off. Once everything is checked off, you know you are ready to file. I know it’s not always easy waiting on tax documents since they can arrive sporadically. Having a template or folder will definitely help you be ready for tax time and hopefully, alleviate some stress. Once you create a tax template, you can copy and edit it from year to year. If anything changes, simply add it in or possibly remove that line for that tax year. If you don’t enjoy updating a spreadsheet, then at the very least keep all tax documents in one secure (and backed up) folder electronically. 5. Work on next year’s taxes… now! This is no joke. If you’re tired of not having everything handy and stressing out over finding receipts, income records, and expenses, then it’s time to get organized. Once you’re organized, it’s easy to stay on track for next year. If you’re a traveler, then remember to record your miles in a travel log or mile tracker app like MileIQ. Yes. Do this all year long. If you’re a small business owner, then make sure you are keeping track of income and expenses. There’s accounting software for every budget and expertise level out there, so find one that fits you. Examples include Wave, Freshbooks, Quickbooks, Xero. Keep track of any medical expenses and charitable donations just in case you have enough to itemize deductions. If you have rental property, record all expenses related to the property (taxes, cleaning, yard work, HOA dues, repairs, upgrades). This way you won’t have to scramble come tax time and struggle to remember expenses or income related to the property. If you stay on track every year, then tax time will be easier. You hand over any spreadsheets, folders or tax documents. Seems easy enough, right? Find a way that works for you to stay organized and use it regularly. Put it on your calendar to enter data weekly or monthly; whatever feels right to you. I promise once you’re organized, you won’t freak out over your taxes anymore! Less stress is a good thing, right? Let me know how I can help you get organized for tax time!